Carl Larsson is one of Sweden's best-loved artists. His stunning watercolours of his home and family from the end of the nineteenth century are acclaimed as one of the richest records of life at that time. 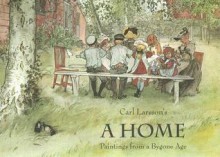 This book features the paintings that depict Larsson's home in the village of Sundborn in west Sweden. A book I loved growing up. Still do.